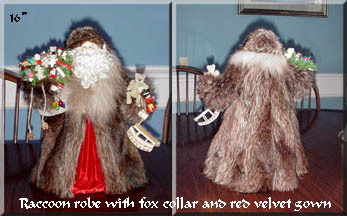 Annette's Santa creations are dressed in absolutely gorgeous, fully lined fur robes. These Santas are hand made in Walkerton, Ontario, by recycling genuine fur coats, real leathers and fine woolens. The Santas have porcelain faces and hands, pure mohair beards, and are made with the finest accent materials. You have to see these to believe them - they far surpass any porcelain Santas that I have ever seen. These Santas are sold in Evelyn and Crabtree stores in Canada. 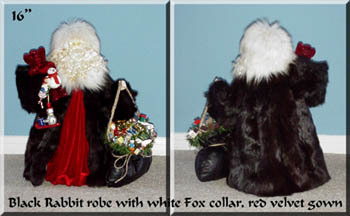 This 16" Santa wears a black Rabbit robe with white Fox trim. He wears a deep red velvet gown. Santa holds a black leather bag of goodies, as well as a beautiful red teddy bear and other toys. 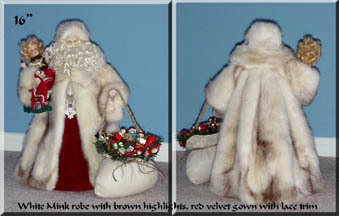 This 16" Santa wears a white Ranch Mink robe with grey and brown highlights. He wears a deep red velvet gown with white beaded lace trim. Santa holds a white leather bag of goodies, as well as a porcelain doll and other toys. This 16" Santa wears a Raccoon robe with fox collar. He wears a rich red velvet gown. 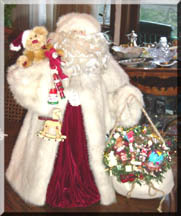 Santa holds a leather bag of goodies, as well as a teddy bear and other toys. 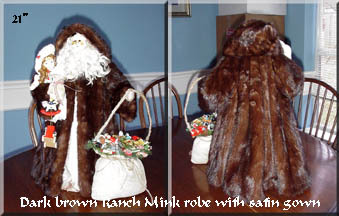 This 21" Santa wears a dark brown Ranch Mink robe. He wears a satin gown. Santa holds a leather bag of goodies, as well as a porcelain doll and other toys. This 22" Santa wears a white mink robe. He wears a red velvet gown. Santa holds a leather bag of goodies, as well as a teddy bear and other toys. All Santas are made lovingly by hand, from recycled fur coats. My santas are sold all across Canada at the Crabtree and Evelyn stores, an exclusive chain at only the finest malls. All Santas have porcelain faces and hands and mohair beards, from angora goats. When the goats are sheared, I buy whole fleeces, which then must be painstakingly sterilized by 5 or 6 careful washings/bleachings. Each curl is then added individually until Santa ends up with a beautiful, thick cloudlike beard. Each Santa wears a fully lined coat of genuine fur, usually trimmed with a different fur for contrast. 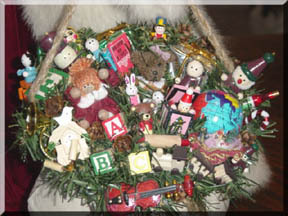 Each sports a genuine leather or suede bag, crammed to overflowing with lots of Christmas goodies and toys.